The Munsters is an American sitcom depicting the home life of a family of benign monsters starring Fred Gwynne as Frankenstein's monster-type head-of-the-household Herman Munster, Yvonne De Carlo as his vampire wife, Lily Munster, Al Lewis as Grandpa, the over-the-hill vampire who relishes in talking about the "good old days", Beverley Owen (later replaced by Pat Priest) as their teenage niece Marilyn Munster, whose all-American beauty made her the family outcast, and Butch Patrick as their half-vampire, half-werewolf son Eddie Munster. The series was a satire of both traditional monster movies and the wholesome family fare of the era, and was produced by the creators of Leave It to Beaver. It ran concurrently with the similarly macabre themed The Addams Family (that aired on ABC) and achieved higher figures in the Nielsen ratings. Season One opening from The Munsters, with Yvonne De Carlo behind the title. On October 26, 2012, NBC aired a modern reimagining of The Munsters called Mockingbird Lane as a pilot. The series failed to be picked up by NBC due to disagreements on the dark nature and inconsistent tone. The Munsters live at 1313 Mockingbird Lane in the city of Mockingbird Heights, a fictional suburb in California. The running gag of the series is that the family, while decidedly odd, consider themselves fairly typical working-class people of the era. Herman, like many husbands of the 1960s, is the sole wage-earner in the family, though Lily and Grandpa make (short-lived) attempts to earn money from time to time. While Herman is the head of household, Lily makes many decisions, too. According to the episode in which Lily and Herman Munster were trying to surprise one another for their anniversary, they were married in 1865. Despite the novel approach of the family being (mostly) supernatural creatures (except for niece Marilyn, who is "normal"), the show followed the typical family sitcom formula of the era: the well-meaning father, the nurturing mother, the eccentric live-in relative, the naïve teenager, and the precocious child. The costumes and appearances of the family members other than Marilyn were based on the classic monsters of Universal Studios films from the 1930s and 1940s. 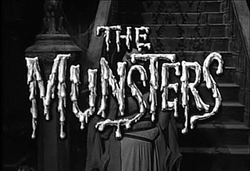 Universal produced The Munsters as well and was thus able to use these copyrighted designs, including their iconic version of Frankenstein's monster for Herman. Other studios were free to make films with the Frankenstein creature, for example, but could not use the costume and style of make-up originally created by Jack Pierce for the 1931 Universal Studios film Frankenstein. The make-up for the show was created and applied to the actors by Bud Westmore, who pioneered many make-up effects and designs for many of the Universal monster movies. The idea of a family of comical monsters was first suggested to Universal Studios by animator Bob Clampett, who developed the idea from 1943 to 1945 as a series of cartoons. The project did not take off until the early 1960s, when a proposal for a similar idea was submitted to Universal Studios by Rocky & Bullwinkle writers Allan Burns and Chris Hayward. The proposal was later handed to writers Norm Liebman and Ed Haas, who wrote a pilot script, Love Thy Monster. For some time, there were executives who believed the series should be made as a cartoon and others who wanted to see it made using live-action. Finally, a presentation was filmed by MCA Television for CBS, using live-action. Originally conceived as a color show, The Munsters was ultimately filmed in black-and-white to save money and so as to resemble the old B&W monster films Universal and other studios used to make. Over the course of season one (completed by Season 1, Episode 7 "Tin Can Man"), makeup for Herman, Lily, and Grandpa was changed. Some of the changes included Lily's hair becoming all black instead of having a gray/white streak on the right side of her head, a change of jewelry to a bat instead of a star, and angled eyebrows. Grandpa was given more exaggerated makeup and heavier eyebrows, and Herman's face was widened to give him a dopier and less human appearance. He also added a stutter to bolster his character whenever he was angry or wanted to make a point, and he frequently left his mouth open, adding to the effect of a more goofy, less frightening, figure. While its humor was usually broad, the series was visually sophisticated. The Munsters' home was a crumbling Second Empire Victorian mansion, riddled with smoke, filthy with dust and cobwebs. A running joke was that when Lily "dusted" the house, her Electrolux emitted clouds of dust, which she applied to surfaces most people would clean. As a running gag, parts of the house would often be damaged (mostly by Herman's tantrums or clumsiness), but the damage would not exist later. Although many episodes featured scenes outside the house, much of the action took place within the walls of the home. The Munster family's multi-level Victorian home had the fictional address of 1313 Mockingbird Lane in Mockingbird Heights. (The town's location is not specified in the series, but in later incarnations, it is described as a small town outside Los Angeles. Leo Durocher, who was then coaching with the Los Angeles Dodgers, guest-starred as himself in one episode, further hinting that the show was set in, or near, Los Angeles.) The exterior shots were filmed on the Universal Studios backlot. In the 1950s, it was assembled with other homes on the backlot. Until production of The Munsters in 1964, the house could be seen as a backdrop on many shows, including Leave It to Beaver. It was also the home of the family in Shirley (NBC, 1979–80) and has appeared in other TV shows such as Coach and (after a remodel) Desperate Housewives. The interiors for the Munsters's mansion were filmed entirely on an enclosed sound stage. In the fourth episode ("Rock-A-Bye Munster"), Lily buys a hot-rod and a hearse from a used car dealership and has them customised into one car (Munster Koach) for Herman's birthday present. The Munster Koach and DRAG-U-LA were designed by Tom Daniel and built by auto customizer George Barris for the show. The "Munster Koach" was a hot rod built on a lengthened 1926 Ford Model T chassis with a custom hearse body. It was 18 feet long and cost almost $20,000 to build. Barris also built the "DRAG-U-LA," a dragster built from a coffin (according to Barris, a real coffin was, in fact, purchased for the car), which Grandpa used to win back "The Munster Koach" after Herman lost it in a race. The instrumental theme song, titled "The Munsters's Theme", was composed by composer/arranger Jack Marshall. The theme song's lyrics, which the sitcom's co-producer Bob Mosher wrote, were never aired on CBS. Described by writer Jon Burlingame as a "Bernard-Herrmann-meets-Duane-Eddy sound", the theme was nominated for a Grammy Award in 1965. A sample of the theme was used in the song "Uma Thurman" by Fall Out Boy. The first presentation was 16 minutes and in color (later cut to just over 13 minutes) and was used to pitch the series to CBS and its affiliates. It never aired, and the script was reused as the basis for episode 2, "My Fair Munster". The cast in order of appearance in the title sequence were: Joan Marshall as Phoebe (instead of Lily), Beverley Owen as Marilyn, Nate "Happy" Derman as Eddie, Al Lewis as Grandpa, and Fred Gwynne as Herman. Although the same house exterior was later used in the actual aired series, it was changed at that point to make it look more gothic and "spooky". Changes included adding the tower deck and Marilyn's deck, a new coat of paint, and enlarging the living room. Although Grandpa had the same dungeon, Herman did not have padding in the pitch episode, had a more protruding forehead, and was broad but thin. The most noticeable difference was his somber expression, compared to his comical silliness during the series. All characters, except Marilyn, had a blue-green tint to their skin. The biggest character difference was that Eddie was portrayed by Derman as a nasty brat. The title sequence had light, happy music (picked up from the Doris Day movie The Thrill of It All) instead of the more hip surf theme that was to come. The episode is available on the complete first season of The Munsters DVDs. It was also decided that Joan Marshall looked too much like Morticia Addams and that Happy Derman was too nasty as Eddie, so both were replaced. On the basis of the first presentation, the new series, still not completely cast, was announced by CBS on February 18, 1964. A second black-and-white presentation was made with the new actors. In this version, Butch Patrick's Eddie appeared with a more "normal" look, although his hairstyle was later altered to include a widow's peak. Between season one and two, the Munster family appeared in an Easter special, when they visited Marineland of the Pacific in Palos Verdes, California, to get a new pet for Eddie. It aired just once on CBS on April 18, and was long thought lost until a copy was donated to the Paley Center in New York in 1997. Reruns of this series aired on Nick at Nite in the 1990s. It also aired on TV Land from 2000 to 2008. On October 5, 2015, Cozi TV began airing the show. The show is currently aired in a two hour block on Sunday evening prime time. In 1973 there was an animated one hour special for ABC, the Mini-Munsters based on characters from the original series. A sequel television series titled, The Munsters Today, ran from 1988 to 1991 and lasted for 72 episodes. The unaired pilot episode, written by Lloyd J. Schwartz, explained the 22-year gap through an accident in Grandpa's lab that put the family to sleep. They awake in the late 1980s and have to adapt to their new surroundings. It featured John Schuck (Herman), Lee Meriwether (Lily), Howard Morton (Grandpa), and Jason Marsden (Eddie). Marilyn was portrayed by Mary-Ellen Dunbar in the unaired pilot, and by Hilary Van Dyke thereafter. A remake from Pushing Daisies creator Bryan Fuller, was developed for NBC. The show was to be a reboot as a one-hour drama with "spectacular visuals". NBC ordered a pilot episode, and announced in January 2012 that it would be called Mockingbird Lane, a reference to the Munster family address at 1313 Mockingbird Lane. NBC ultimately canceled plans for Mockingbird Lane to be produced as a weekly series, but later announced the pilot episode would air in late October 2012 as a Halloween special. In August 2017, it was announced that Seth Meyers is developing a modern-day interpretation of the series. The series will place with the Munsters in Brooklyn, New York where they try to fit in as an ordinary family. Between 2004 and 2008, Universal Studios Home Entertainment released the entire series on DVD in Regions 1 & 2. The "Family Portrait" episode in color, which was absent from the season 1 and 2 standalone box sets, was released on a standalone Region 1 DVD on October 7, 2008. Several Munsters movies were released, three featuring original cast members. Other merchandise included a set of rubber squeaky toys, Colorforms, and an Aurora model kit of the living room and family. AMT produced model kits of the Munster Koach as well as Drag-u-La. The Aurora model of the living room featured Herman in his electric chair, Eddie squatting in front of the fire, Lily was knitting and Grandpa was hanging, bat like, from the rafters. Marilyn was not included. ERTL later produced a very detailed 1:18 scale diecast of the Munster Koach. Mattel issued two Herman Munster Dolls, one was a talking doll and the other was a hand puppet (both having chatty rings that you could pull to make them talk utilizing Gwynne's actual voice) that were issued from 1964 until around 1968. A video game based on the Munsters was published by "Again, Again" (a division of Alternative Software) in 1989. It was available for the Amstrad CPC, ZX Spectrum, Commodore 64, Commodore Amiga, Atari ST, MSX, and DOS, but was heavily criticized by gaming press at the time because of its short length and lackluster game play. In 1990, Atari Corporation released Midnight Mutants for the Atari 7800, featuring Al Lewis' likeness in his Grampa Munster character on the box art and label art. However, since Atari did not sign an agreement with Universal, they could not call him "Grampa Munster"; he was simply called "Grampa". The first episode guide for the series was written by Richard H. Campbell for Media Sight #3, 1981. Sawyer's View-Master Stereo Pictures issued a 3-D reel set of The Munsters depicting the episode "The Most Beautiful Ghoul in the World" in 1966, Packet No. B 481. The set contains three reels, each with seven 3-D views, as well as a small booklet containing drawings and additional text. The View-Master set is notable because the photographs provide rare color views of the characters and sets, including house interiors and Grandpa's dungeon laboratory. The photos are an accurate depiction of the characters' makeup as designed for black and white filming. Herman, Eddie, and Grandpa all wear heavy greenish-white facial makeup, which contrasts noticeably with their un-made-up hands and wrists. Lily, besides heavy facial makeup, has light greenish-white makeup on her hands and wrists. Marilyn, identified on the packet as "Daughter Marilyn," is of course in non-character "normal" makeup. The Munsters: A Trip Down Mockingbird Lane. ^ Fox, Margalit (December 19, 2006). "Chris Hayward, 81, TV Writer and a Creator of 'Munsters,' Is Dead". The New York Times. Retrieved 2010-10-10. ^ "The Munsters: The Complete First Season". DVD Talk. Retrieved 2010-12-07. ^ "The Munsters: The Complete Series". DVD Talk. Retrieved 2010-12-07. ^ "Munsters, The". Golden Globes. Retrieved April 6, 2018. ^ Genzlinger, Neil (March 14, 2005). "'TV Land Awards' turn back the time". Chicago Tribune. New York Times News Service. Retrieved April 6, 2018. ^ Fred John Del, Jr., Bianco (2012). 50 Favs of the '60s '70s '80s: A Look Back at Three Dynamic Decades. AuthorHouse. p. 58. ISBN 1-468-56111-1. ^ Decaro, Frank (October 26, 2008). "A Neighborhood Where Every Day Was Halloween". The New York Times. Retrieved 2010-10-10. ^ Andreevs, Nellie. "NBC May Take Another Stab At 'The Munsters' Reboot Series". Deadline. Retrieved September 18, 2016. ^ a b The Munsters: America's First Family of Fright (Television production). 2003. ^ Ingram, Billy (2002). Tvparty! : Television's Untold Tales. Bonus Books, Inc. p. 228. ISBN 1-566-25184-2. ^ Cox, Stephen; De Carlo, Yvonne; Patrick, Butch (2006). "Munster Maestro: About Jack Marshall". The Munsters: A Trip Down Mockingbird Lane. New York: Random House. ISBN 0-8230-7894-9. OCLC 68192546. ^ a b Cox, Stephen (2006). The Munsters: A Trip Down Mockingbird Lane. Random House Digital, Inc. pp. 35–36. ISBN 0-823-07894-9. ^ Cox, Stephen (2006). The Munsters: A Trip Down Mockingbird Lane. Random House Digital, Inc. pp. 36, 38. ISBN 0-823-07894-9. ^ "Pop Colorture". Retrieved 2017-09-19. ^ Joyce Eng (September 30, 2010). "NBC, Bryan Fuller Remaking The Munsters". TVGuide.com. ^ Michael Schneider (August 11, 2011). "Exclusive: The Munsters Back in Development at NBC". TVGuide.com. ^ Hanh Nguyen (November 17, 2011). "NBC Picks Up Munsters Reboot Pilot From Pushing Daisies Creator". TVGuide.com. ^ "NBC Orders 'The Munsters' Reboot to Pilot". Yahoo TV. November 17, 2011. Archived from the original on January 4, 2014. ^ Jeffery, Morgan (February 2, 2012). "NBC's 'The Munsters' becomes 'Mockingbird Lane'". Digital Spy. Retrieved February 2, 2012. ^ Andreeva, Nellie (October 11, 2012). "NBC's 'Mockingbird Lane' Pilot To Air on October 26 As Halloween Special". Deadline. Retrieved October 24, 2012. ^ "Seth Meyers Rebooting The Munsters TV Show". ScreenRant. 2017-08-10. Retrieved 2018-10-13. ^ "The Munsters - The Complete First Season: Fred Gwynne, Yvonne De Carlo, Al Lewis, Butch Patrick, Beverley Owen, Pat Priest, Bob Mosher: Movies & TV". Amazon.com. Retrieved 2018-10-13. ^ "The Munsters: Season 1: Fred Gwynne, Yvonne De Carlo, Al Lewis, Butch Patrick, Pat Priest, Beverley Owen, Bob Mosher: Movies & TV". Amazon.com. Retrieved 2018-10-13. ^ "The Munsters - Complete Second Season: Fred Gwynne, Yvonne De Carlo, Al Lewis, Butch Patrick, Pat Priest, Beverley Owen, Bob Mosher: Movies & TV". Amazon.com. Retrieved 2018-10-13. ^ "The Munsters: Season 2: Fred Gwynne, Yvonne De Carlo, Al Lewis, Butch Patrick, Pat Priest, Bob Mosher: Movies & TV". Amazon.com. Retrieved 2018-10-13. ^ Walmart. "The Munsters: The Complete Series (DVD)". Walmart.com. Retrieved 2018-10-13. ^ "The Munsters: The Complete Series: Fred Gwynne, Yvonne De Carlo, Al Lewis, Butch Patrick, Pat Priest, Beverley Owen, Bob Mosher: Movies & TV". Amazon.com. Retrieved 2018-10-13. ^ "The Munsters: Family Portrait: Fred Gwynne, Al Lewis, Yvonne De Carlo: Movies & TV". Amazon.com. Retrieved 2018-10-13. Wikimedia Commons has media related to The Munsters.